A landing page is a page for a precise audience with only and ONLY one specific conversion goal. A normal web page has too much information, too distracted while a landing page only focuses on one which is to convert. Sometimes you do not want your visitor to browse around or be distracted. You want them to be focused on one thing and one thing only. That’s exactly when a landing page comes in handy. On a landing page there are no distractions. The visitor has only two choices: convert or leave. What Is A Landing Page Conversion Goal? If you like to success, you need landing pages. Because a landing page is built specifically for one conversion goal, it is very good at it. You will get higher sign-up rates on a lead generation landing page than on a normal web page. Sales will be higher on a purchase focused landing page than on a general sales page. This is why every business, including YOURS, needs landing pages. HOW BIG BRANDS USE LANDING PAGES? These terms are synonyms and define a landing page with an email sign-up as a conversion goal. 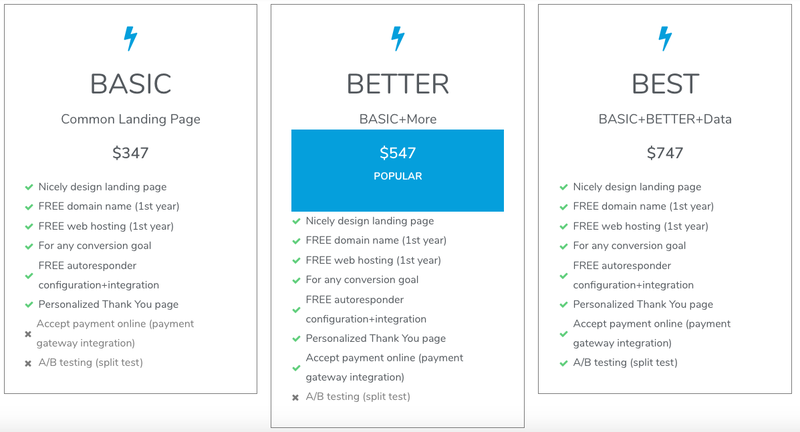 You also can have a landing page with a different conversion goal. The landing page also useful to inform your visitors about your incoming or coming soon product or service. In the page, you collect email leads and by the time you launch it, most of the leads can be your customers in no time. Get Your Landing Page Now! Starting from just $347, our landing page design service will give you an attractive landing page that will convert. Increase your sales with our highly-converting landing page for your business using WordPress based solution.